Join the Ride Free family or Self Drive for a 4 or 5 day long journey through some of the most famed destinations in the Western United States as we travel historic Route 66 on our way to visit Grand Canyon National Park, Las Vegas, Death Valley opton, Zion, and more. The Ride Free Tour Team will pick you up at the hotel and head directly to pick up your bike. Once everybody in the group has been checked out the Ride Free Tour Team will give a safety briefing and answer any questions before we saddle up and hit the road. If you have never been part of a group ride on a Harley Davidson or touring bike before, you will find yourself grinning ear to ear as you realize that you have quickly become the object of envy for every pour soul stuck in their cars on the Los Angeles Freeway system. The only sound more satisfying than the roar of the engines of your fellow riders around you is the rumble of your own bike as you leave Los Angeles in your mirrors and the great American city gives way to lonely cacti and the inviting warmth of the California dessert. You have been waiting a long time for this day. Enjoy the feeling. After a lunch stop at a roadside diner we will open into the Nevada dessert before dropping down the valley towards the banks of the Colorado River and the small casino city of Laughlin, Nevada. After checking into the hotel, we’ll enjoy a group dinner before turning you lose to try your luck on the craps tables, slot machines and blackjack tables. Just remember to save few bucks because Las Vegas is just a few days away. Vegas Start – We go to Red Rock Canyon and The Hoover Dam. As well as explore the mountains around Vegas. Then work our way to Laughlin. 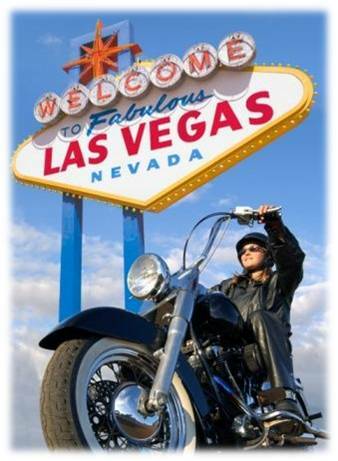 If you are up for some serious riding, we can go from Vegas to Death Valley, then end after a long day in Laughlin. For many, this is one of the most anticipated days on our journey, as we trace the path of American history along an open stretch of one of the world’s most infamous highways, Route 66. Feel the rumble of your bike as we open up our throttles and race back in time. You can almost see the old steam engine carrying passengers to a new life in the West along the 100 year old tracks that run parallel to Route 66. Gas stations and roadside diners still dot the same landscape that the first Harley Davidson motorcycles sped eastbound from Milwaukee so many years ago. We are now at one with the road as we leave a little piece of our own history on this great American highway. We will soon be leaving the roar of Route 66 for the quiet serenity of the most recognizable destination in the Southwestern U.S., Grand Canyon National Park. We will enter the Park and ride along the rim of the Grand Canyon at dusk as we make our way to the lodge for the evening. Once we settle in for the night we’ll enjoy a short walk to stand together in awe of one of the Great Wonders of the World. For those of you who want the full experience, we’ll organize an early morning walk to watch the sunrise over the Grand Canyon. You’ll have to see it to believe it. What an incredible day we have ahead of us! We’ll putt along the rim of the Grand Canyon once again as we make our way out of the Park for the scenic ride into the state of Utah on our way to Zion National Park. This region is rich in Native American history and we will have plenty of time to stop at road side stands and shop for Native American handcrafts or just to talk with people whose ancestors have called this area home for hundreds of years. These people are as proud and prominent as the great landscape that rises before us as we enter the visual wonder that is Zion. I’ll warn that you may forget all about the Grand Canyon once we enter Zion National Park. While Route 66 to Grand Canyon is easily the most anticipated day for our fellow riders, this is almost always the most memorable. It is difficult to paint a description of Zion that can measure up to the actual experience of riding through it so I will leave it to your imagination, except to say WOW. We will get an early start today so we can arrive in Las Vegas with plenty of time to cut loose. Leaving the cool air of Zion, we will drop down into The Valley of Fire, a moonscape of deep red clay earth and rock formations that open once again into the Nevada dessert. Here comes that ear to ear grin once again as Las Vegas starts to grow in the distance. The only sensation that can come close to matching the wonder of the Las Vegas cityscape at night is cruising down the Las Vegas Strip amidst the rumble of your fellow riders and newfound friends as we make our presence clearly known. What happens next? That’s all up to you. Las Vegas is, well, Las Vegas. Walk the famed Las Vegas strip at night, take in an amazing show or redeem yourself at one of the great casinos. The choice is yours. We’ll organize a group dinner and some fun for those of you who want to come along. For the rest…Viva Las Vegas! On a 4 Day Tour, we turn the bikes in at the end of the day, and say our good byes after dinner. On a 5 Day Tour, the hotel is included tonight. We continue our journey the next am. We Ride from LA to Vegas. Following parts of old Route 66 on our Harley Davidsons. Our destination is the Santa Monica Pier, which is the end of Route 66. We then work our way past Venice Beach, and follow the coast and turn our bikes in at the end of the day. The last day of the trip is always accompanied by a swirl of emotions. You have become like family with your fellow riders and the Ride Free Tour Team, and you are wishing for just a few more days on the road. However, things start looking up again as we spot the Pacific Ocean on the horizon. We’ll drop down and run along California’s famous Pacific Coast Highway for a stretch to the Santa Monica Pier before turning inland towards our last stop. We will head to one of our favorite restaurants to enjoy one last meal together. This is one of our favorite times of each trip. Not because it is the end, but because we all get a chance to go around the table and talk about what we found special about the ride, the experience and, most importantly, the group. We love to hear, as is almost unanimously the case, that the Ride Free family far exceeded your expectations of what you would get out of this time on the road. We may even start planning the next year’s trip together before saying goodbye after dinner.